Fluffy Blueberry Greek Yogurt Pancakes ~ stuffed full of juicy ripe blueberries. A great way to start the day! I am, without a doubt, a Greek Yogurt fanatic. I add it to my smoothies, eat it with granola, and even serve it dolloped on a piece of grilled chicken mixed with hot sauce. I’m partial to Fage and they didn’t pay me to say that. 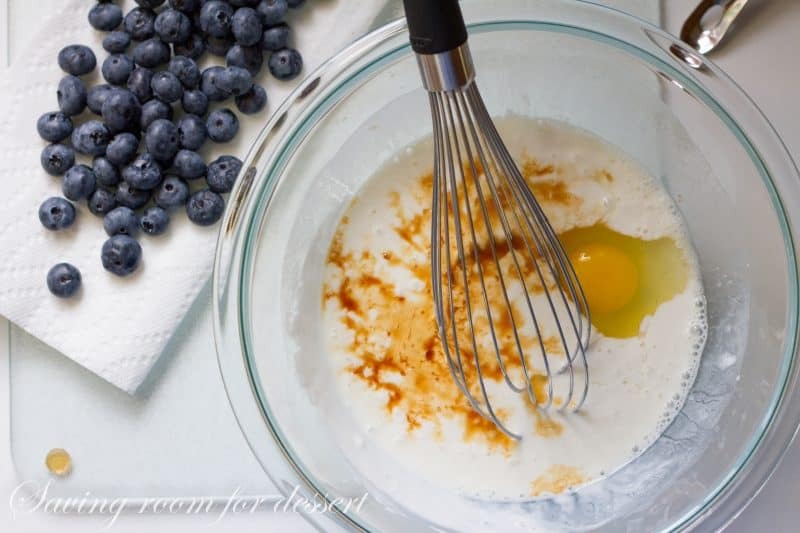 So you know I’m going to love a light, fluffy, thick pancake chocked full of fresh blueberries and lots of Greek Yogurt! We have a long weekend coming up here in the U.S.A. so maybe you’ll find a few extra minutes to whip up these lovely pancakes. In a small mixing bowl combine the flour, baking powder, baking soda, and sugar. Set aside. In a medium mixing bowl whisk together the yogurt, milk, egg and vanilla. 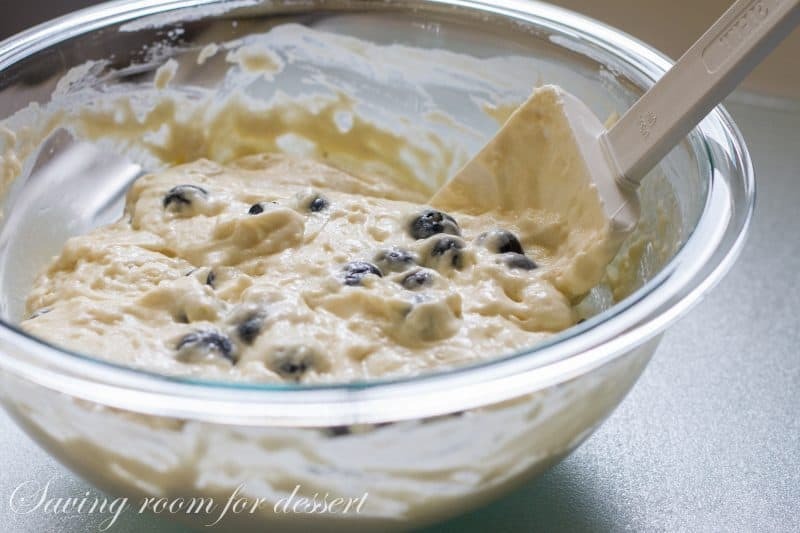 Fold in the flour mixture, then the blueberries. Cook until puffy and golden brown. Serve with an extra dollop of Greek Yogurt, sliced almonds and fresh blueberries if desired. Drizzle with honey or syrup and serve! Don’t Forget to PIN to your favorite breakfast board! 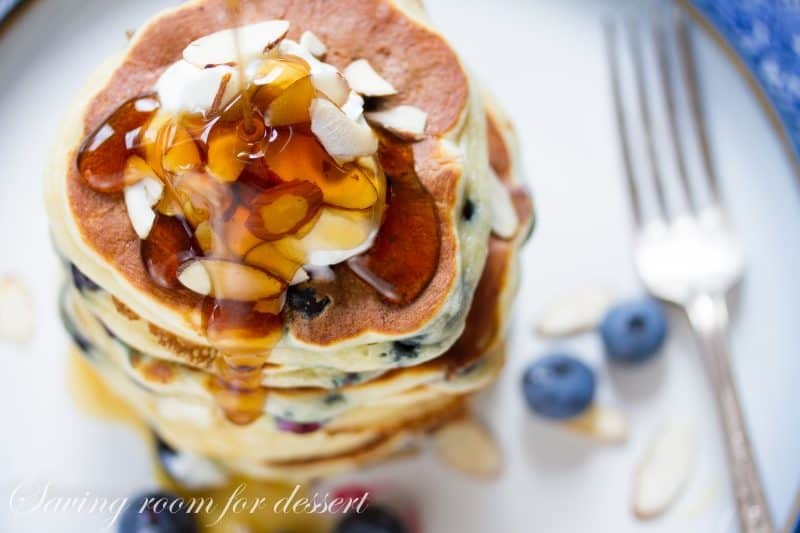 Fluffy light Greek Yogurt Pancakes stuffed full of ripe blueberries. A great way to start the day! In a small mixing bowl combine the flour, baking powder, baking soda, salt and sugar. In a medium mixing bowl combine the Greek yogurt, almond milk, the egg and vanilla. Whisk until smooth. Add the flour mixture to the yogurt mixture and blend well. Gently fold in the blueberries. Preheat a non-stick skillet over medium heat. Lightly grease the skillet with oil using a paper towel to remove the excess. Lower the heat to medium-low and add 1/4 cup of batter at a time for each pancake. Turn the pancakes when the bottom has browned and the edges are drying. Cook another few minutes or until golden brown and cooked through. Serve and enjoy! Do you have big plans for the long weekend? I hope you have fun and cook something amazing. We have a few plans so I hope to share our adventures with you next week. Thanks so much for stopping by! Hi I was wondering if I can use plain yogurt for this recipe? Please let me know! Thanks! Sure Paige – I think it will be fine. The batter may be a little less thick but the flavor should be spot on! By staring at your pictures, I feel to pick up one right from my lappy…How did you give them circle shape? I’m scare to try if it gets thick from one side or thin from other end. 🙁 I must say this is simply YUMMY POST! 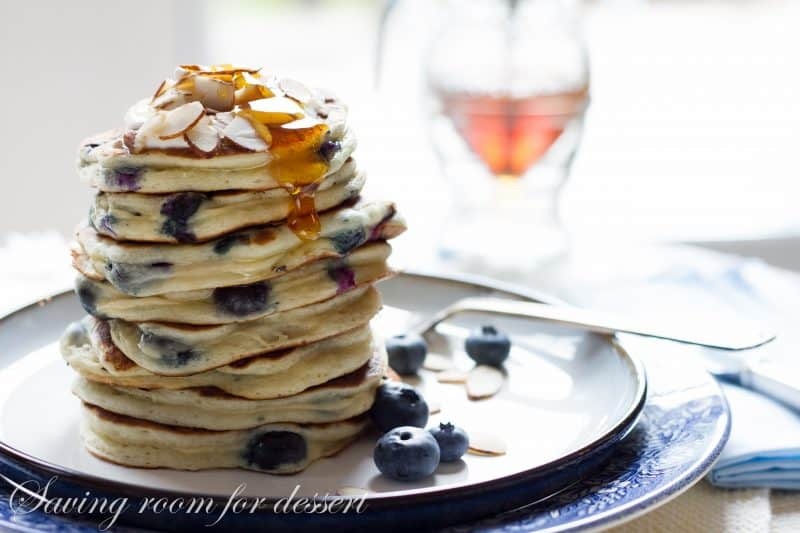 sometimes I wish I grew up in the States where making pancakes for breakfast was as natural as breathing… your pancakes looks so beautiful and so easy to make but I feel like I need to fly you over to Belleau to come make them for me! We always have Greek yogurt in the fridge because I like it with breakfast. I chop an apple, toss in some chopped dates, chopped almonds and some flaked coconut. However… these pancakes sound even better! Oh, I'd like to dig into that stack of pancakes! They look delicious! We're having a cookout for some neighbors tomorrow so I will be busy cooking today. Have a great weekend! They look amazing! Blueberry pancakes are my favorite. 🙂 No plans here for the weekend, except to recover from the first week of school! Can oatmeal be used instead of flour? That's a gorgeous stack of pancakes, Tricia. My mouth is watering terribly. Oh Tricia I need to make these, they look incredible. I have been using Greek yogurt a lot in my baking, mostly to replace buttermilk when I don't' have it, and I love the results. Hi Tricia, we buy Fage at Costco, love it, will have to try these pancakes, anything you post is delicious!!!! These look incredible! So fluffy and amazing. I am also partial to Fage when it comes to yogurt…I've never used yogurt in pancakes and I've got to try it! Thanks, Tricia. Have a wonderful Labor Day weekend! You're going to love these Monica – have a great weekend. Oh wow – love the looks of that stack.